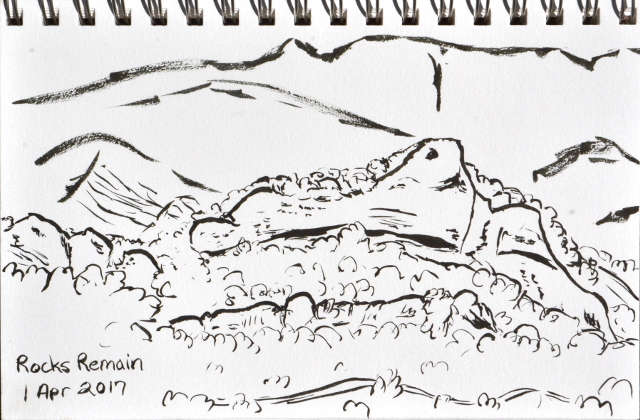 Just two nearly bookending sketches for the month. They even seem to have been along the same theme. The lines of rocks below Matias Trail. 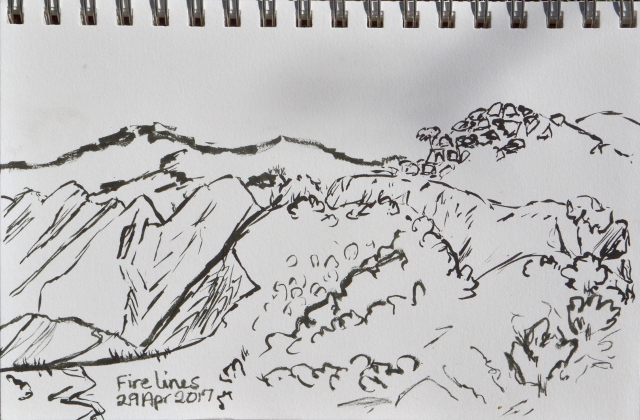 The lines of rocks starkly left after the burn at El Capitan. 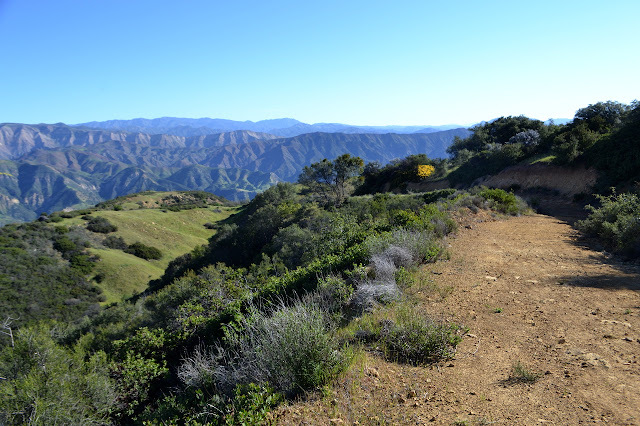 I found my way up Romero Canyon Road and down Romero Canyon Trail for the lower loop. 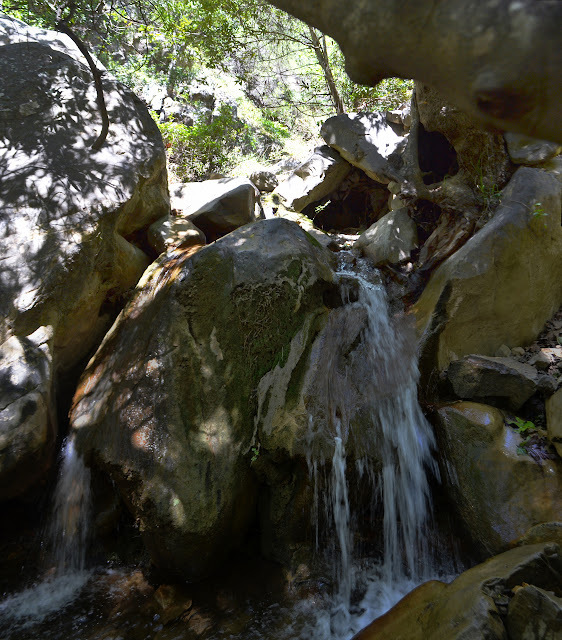 Of course, that means passing by the little waterfall just above the second creek crossing on the trail. It is a lovely thing with smoothed chutes and travertine forming. 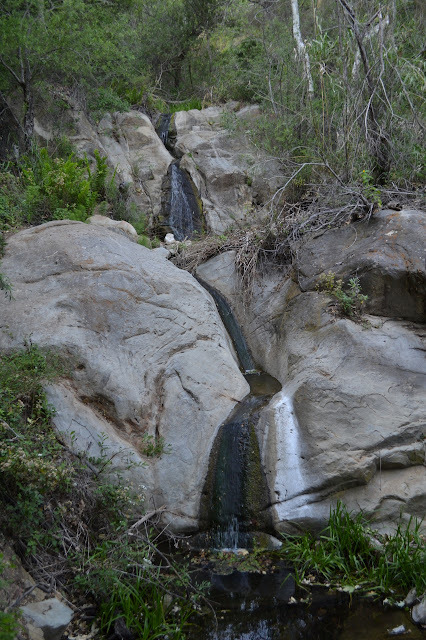 The waterfall along Romero Creek. Otherwise, the trail was much as it has been before. The Sherpa Fire burned through much of the foothills around El Capitan almost a year ago, but the area is open to hike the Bill Wallace. I park on the dirt lot at the entrance to Ocean Mesa Campground. 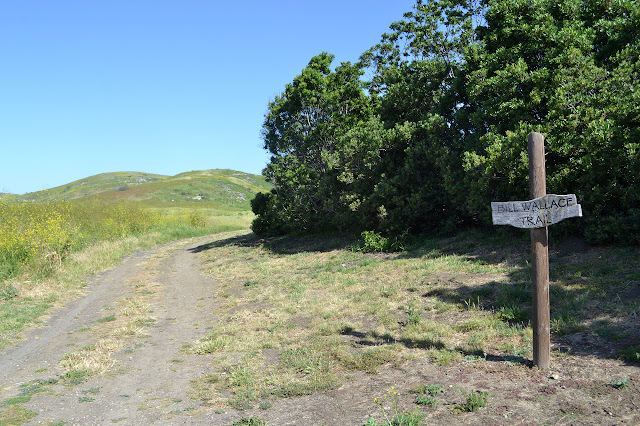 There is a sign that points around the corner along a bit of campground road out to the hills. From the road, a slot has been mowed through the tall mustard to the old sign saying "easy" to the right and "hard" to the left. The fire did not quite get everything. The start of the Bill Wallace Trail. 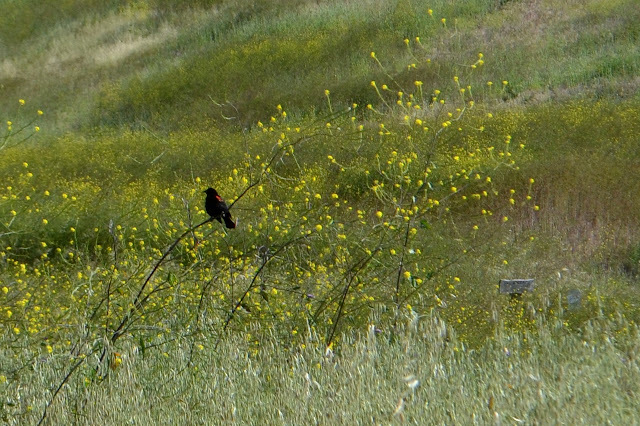 A red winged blackbird sits atop a bit of mustard as I near the trail split. This time, I turn toward the "hard" side. We shall see just how hard that really is. It winds upward on the hill. The trail is narrower and the mustard is joined by thistle, but mostly just far enough that I can avoid getting stabbed. Both tower over my head. The trail gets narrower up higher and waist high star thistle joins in on the stabbing game. Tiny needles, but at least they only hurt when actually in contact. Rocky sections offer some relief as they are covered in grasses and morning glory. Near the top of the hill is the "1 mile" sign I missed on my first hike. This time, the GPS will mark off the same miles as the signs, if any of the rest still exist, rather than a half mile short after taking the "easy" way. 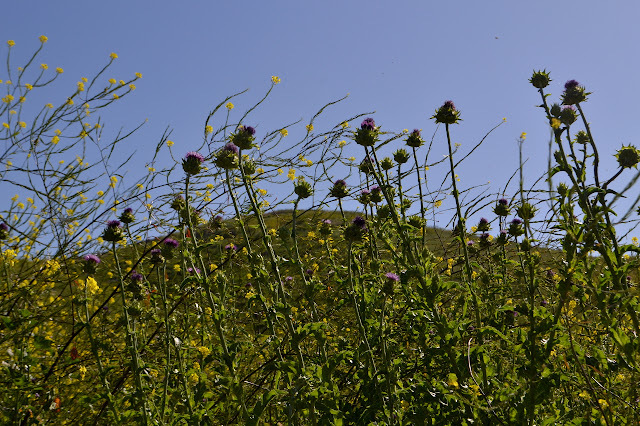 The thistles and mustard are as high as an elephant's eye and it looks like it is climbing clear up to the sky. Heading up to the old Hot Springs Club hotel site like quite a few other Friday evenings with the Sierra Club social hike. Al generally takes the road up and back, but I very much like the trail, especially when it is light and the water is flowing. I tend to mutiny and take the trail. It seems to have become official at some point because when they brought out the new signs, this one was marked with the rest. Today, there is one more sign added to the collection. 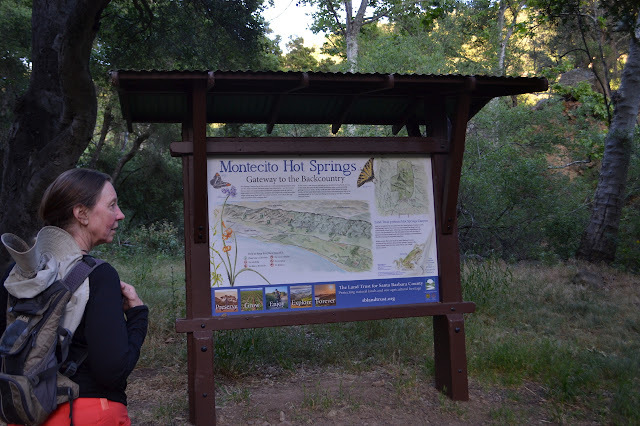 A huge sign has been added with a trail map on one side and history of human habitation on the other. The local area trails map is useful, but the area overview map with relief mountains is too cartoonish and incomplete to be useful. The history seems rather cartoonish too. The creek does make a lovely sound as we wander upward. The poison oak is not too bad along here, it must be getting plenty of traffic. We stop by the little waterfall to watch the water cascade and the frogs swim. Judging by the sounds around us, they are very thick around the big pool at the bottom. It is quite a pretty little waterfall. 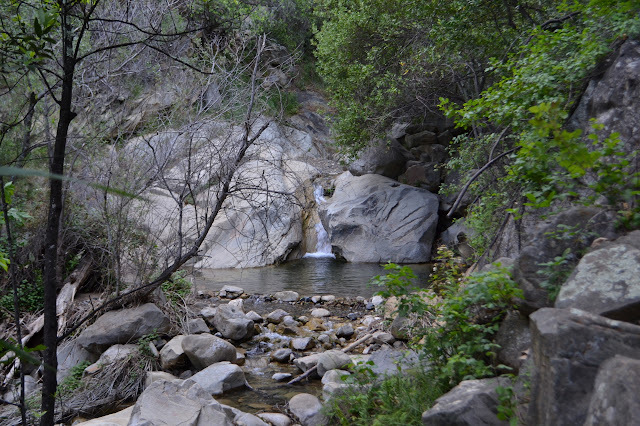 I headed out for a quick trip up to see San Ysidro Falls again. It has been very nearly two months since the last time and I am expecting a little less water over the top. One of the little pools along the way. There is still some water coming down the main creek and quite a good crop of poison oak. 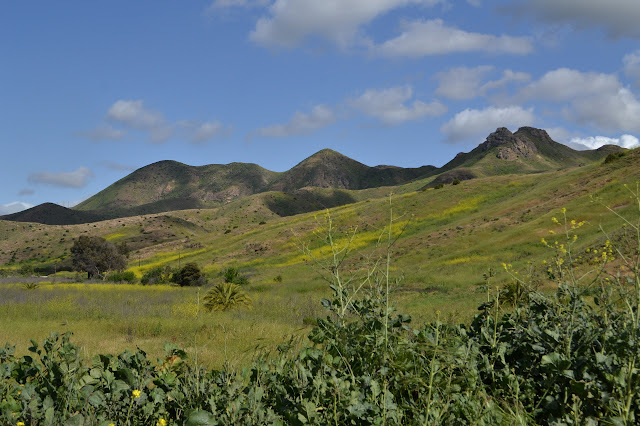 This area was formerly Camarillo Regional Park, but was transferred from the county to the state with the provision that the state would take on all the use requirements for the area. One of these requirements is that a publicly accessible park be maintained. Apparently this does not preclude a parking fee because the general $6 per day fee for the university applies here too. Areas outside the gate would allow a bit of free parking, but has been marked "no parking". There is some free parking on Lewis Road, nearly a half mile away. Being with my mother, she chose to pay the fee rather than walk the extra mile. There is no toilet, the only amenity gained for the fee is a dirt parking lot. But it is a pretty spot. The trail just wanders through some beautiful country and an approximate plan was hatched quite some time ago to see it. Putting the finishing touches on it, I dropped off my bike at the crest of the road by La Cumbre Peak and parked the car at the top of Arroyo Burro. The bike will take care of most of the paved road walking very well and extraordinarily easily. The Glass Factory is already booming with a large variety of explosions from five or six groups of target shooters. Slow and measured or fast and finishing off a clip, there are all kinds of shooters. About two people notice me as I walk past behind them with my fingers in my ears against the sometimes painful level of noise. Happily, no one is set up on the road or up the hill next to it. There is relative calm past the gate and around the hill as the view quickly opens up. Being up high sure is good for views. A view dominated by Little Pine Mountain with some taller things behind it. Sage Hill is on the left, but hard to distinguish against Loma Alta behind it. I start down the fire road somehow not even noticing the trail until it is a cut on the next ridge. This is fine since I am not looking for it. Matias only gets as far as the road. The prickly phlox does not seem to be as abundant as it has been in the past. 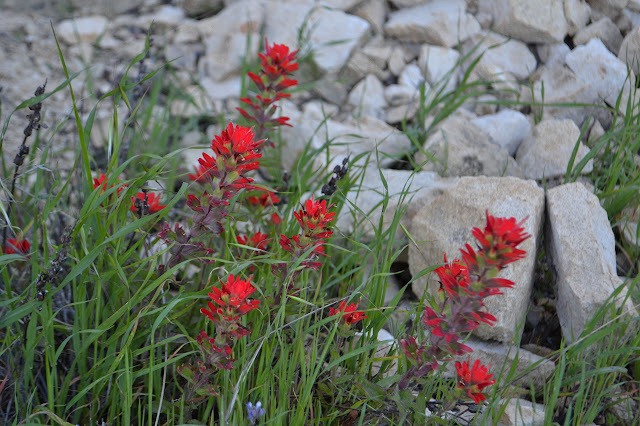 There are a few blooms of it, bush poppies, and a very crimson paintbrush along the edges. Far down in the valley, I can see the thin track of Matias winding through the bushes and grass. It seems to be most of the way down to the river. Slowly wandering downward on the road. A bit of paintbrush dipped in a particularly deep shade of red.